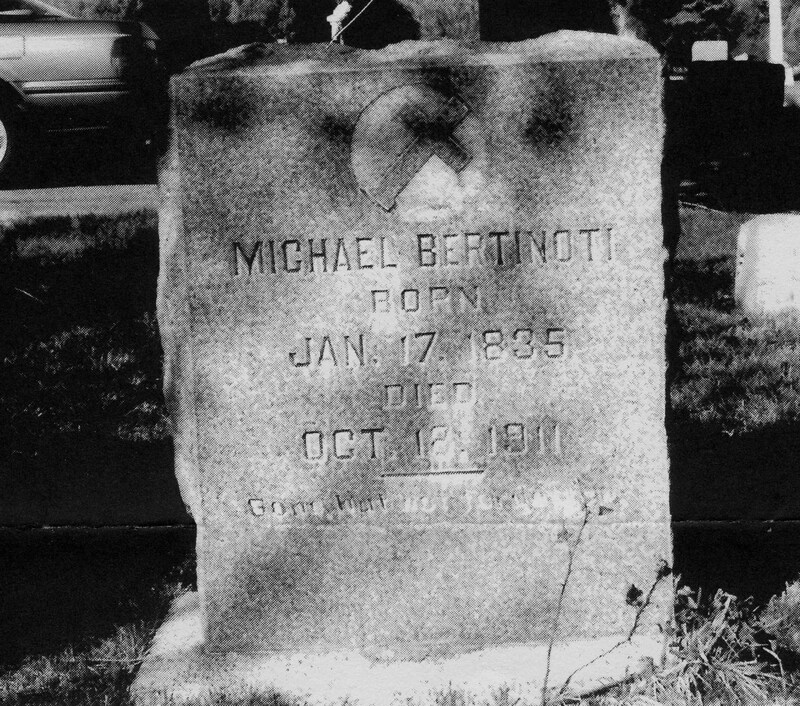 Michael Bertinoti (Bertinotte) (1835-1911), arrived in Utah on the railroad in the 1870s. He left behind a daughter born 1872 in Italy named Maria. 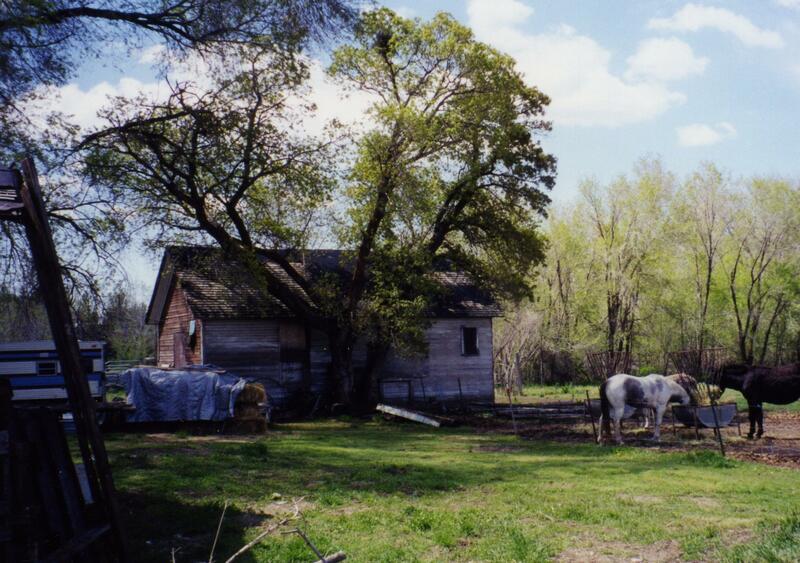 In the 1880 he lived near Five Points working on the dairy farm of Robert Miller. Next door was Ophelia Shaw whose mother, Madeleine Malan, was born Torino Italy. Ophelia was a Mormon and Michael Bertinoti a gentile, but emigrants tended to live by others from their native land for mutual support. Michael’s brother John Bertinoti and his son, Francisco Bertinotti, (1857-1891), came to Ogden after Michael in about 1878. The non Mormon Italian population grew rapidly in Ogden after the coming of the railroad. Michael Bertinoti became a naturalized citizen in 1882, and his nephew, Francisco (Frank) Bertinoti, became a naturalized citizen on Dec. 4, 1888. Eight days later Frank married Martha Combe on Dec 12, 1888, in Ogden. She was also an immigrant from Piedmont Italy who came to Ogden with her family when she was eleven years old. Frank Bertinoti purchased the old Gillson adobe house in 1887, and he and Martha lived in this house on the lane to Harrisville running north off 2nd Street. 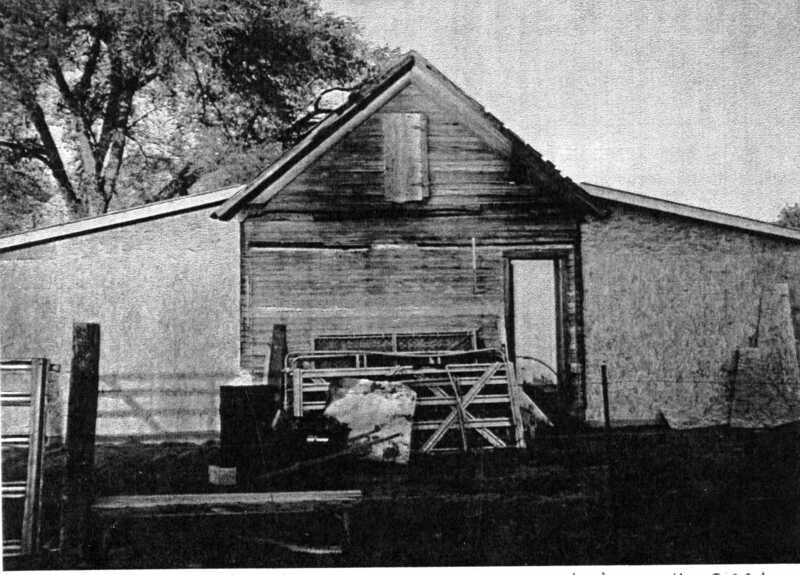 On the farm to the west lived a friend, Victor Reno, who purchased the neighboring farm in the same year, 1887. Frank and Martha had a baby daughter named Mary. YESTERDAY: Frank Bertinoti, his wife Martha and baby Mary lived at 150 W. 2nd St. (rear) from 1887-1891 before his unexpected death. Frank also purchased farmland at the end of what is now 7th Street in the Mill Creek area. This land was irrigated by the 1851 Perry Ditch diverted from Mill Creek. 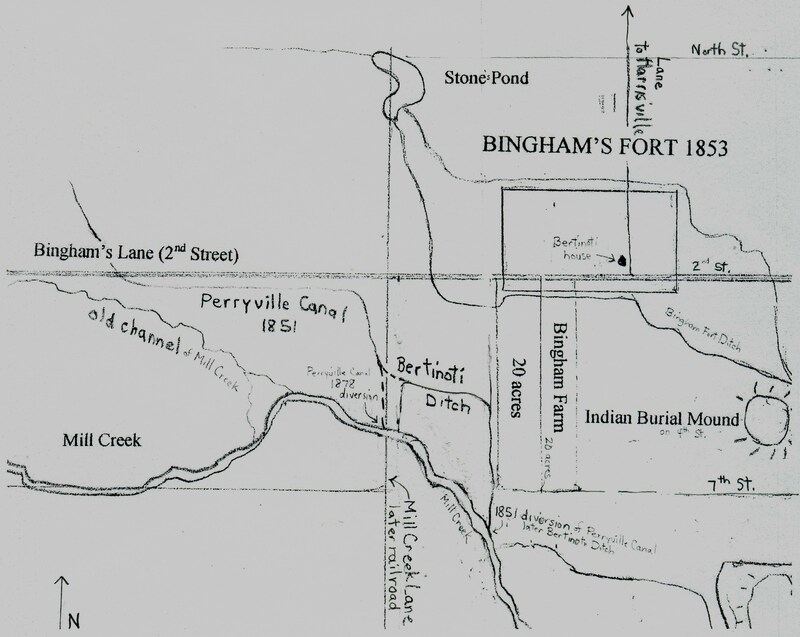 In the 1878 the Perry Ditch Co. built a new diversion from Mill Creek to improve their flow, and the old diversion point and ditch were given to Frank Bertinoti who organized it into the Bertinoti Ditch Co. This ditch continued to irrigate Frank Bertinoti’s farm, the south part of the Bingham farm, and other nearby farm lands. That is how a portion of a pioneer ditch with an 1851 water right came to be named for a non-Mormon Italian. SEE MAP BELOW. Frank died unexpectedly in 1891 at age 34 without a will. His widow, Martha, petitioned the court concerning her dead husband’s estate that involved two tracts of land. Victor Reno became the administrator of Frank’s estate. Four years later, in 1895, Victor Reno sold Frank Bertinoti’s house and some land to Michael Bertinoti for $595. Martha was remarried by the time of the settlement to another Italian immigrant, David Clapier, and they lived in a cabin on the lane to Harrisville between 2nd St. and North St.
After the settlement of Frank’s estate, Michael Bertinoti moved his sister-in-law, Mary Peraca Bertinoti, who was Frank’s mother, into Frank’s former house, and Michael Bertinoti began building a frame house for himself that was located about 200 feet to the south of Frank’s former house. In the 1900 census Michael is listed as a farmer, 65 years old, born in Italy; Mary is listed as his sister (in-law), 64 years old, born in Italy, who cannot read, speak or write English. Her nephew Tom from France was living with her and working as a farm laborer. YESTERDAY: Mary Bertinoti, age 64, lived here in 1900. YESTERDAY:Michael Bertinoti built this frame house next door to Mary in the late 1890s, and in the 1900 census was listed here as a 65 year old farmer. 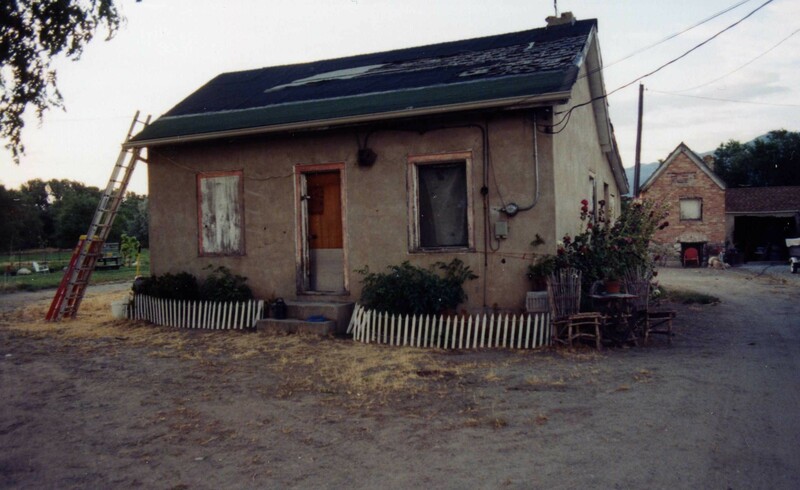 Michael Bertinoti’s house; photo 1999. The joint address of Michael Bertinoit and his sister-in-law was “rear 150 or 152 W 2d” in various Ogden City Directories. 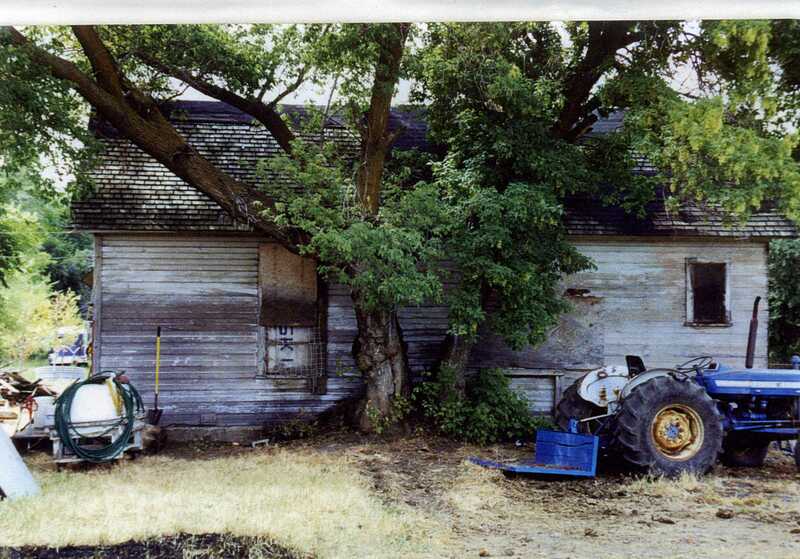 “Rear” meant it was located off 2nd Street on the lane to Harrisville. When Michael left Italy in the 1870s, his daughter, Maria, was only a baby. In 1896 his grown-up daughter, Maria Bertinoti, and her husband, Baptista Maero, arrived from Italy, to join her father in America. 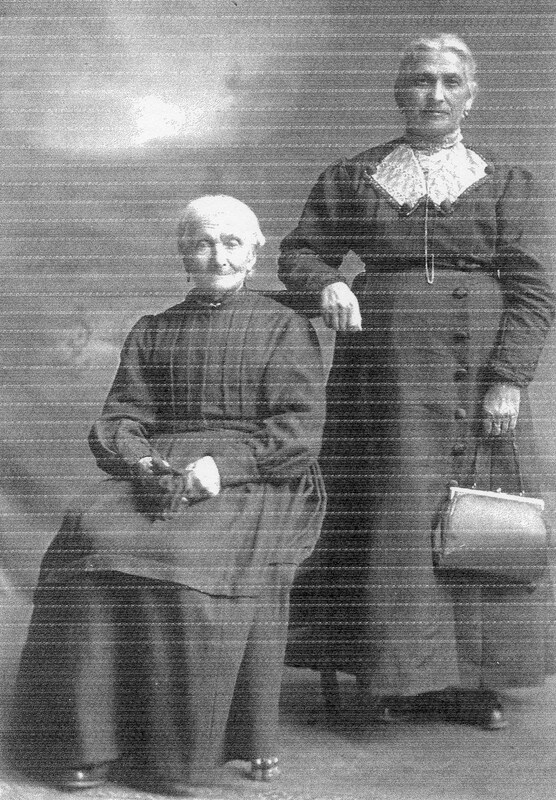 The next year, in 1897, Mary Peraca Bertinoti’s daughter, Anna, and her husband Joseph Genta, arrived from Italy to join her mother in America. Unfortunately Joseph Genta died in 1907, and Anna Genta and children moved in the old Gilson farmhouse with her mother. YESTERDAY: Mary Peraca Bertinoti and her dau. Anna B. Genta, circa 1915. Members of the Genta family lived here until the 1960s; the exterior walls were covered with cement for preservation. In 1908 Michael Bertinoti sold a tract of land to Mary Bertinoti Long, the grown-up and married daughter of his deceased nephew, Frank Bertinoti, for one dollar. He had purchased her inheritance in 1895 after Frank died and gave it to her when she was of age. Michael Bertinoti died in October 1911. His niece, Anna Bertinoti Genta, purchased both his houses on W. 2nd Street in Jan. 1912 for $850. Her mother, Mary Peraca Bertinoti, died in 1920 age 85. 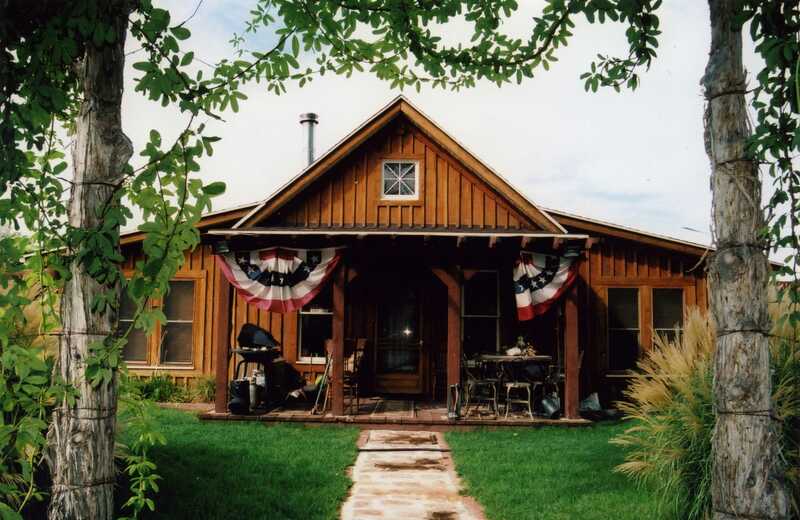 Members of the Genta family continued to live in the old farmhouse for the next 40 years. During the course of the years the board and adobe exterior walls were covered with cement for preservation. Obituary: BERTINOTTE – Michael Bertinotte died Wednesday night (18 October 1911) at 11:30 at home in the rear of 150 West Second Street. Mr. Bertinotte was born in Italy January 17, 1834, but had resided in Ogden for the past 44 years. He leaves a number of relatives. TODAY: In 2001 two wings were added to Michael Bertinoti’s house; rear view. TODAY: Michael Bertinoti’s remodeled house in 2007. Interview Joan Maero Wright by Anna Keogh, Oct. 11, 2006: Michael Bertinotti married Clara Rossi on April 21, 1868 in Italy; they had two daughters, Cattarina b. 1870 and Maria b. 1872. Richard Roberts & Richard Sadler, A History of Weber County, 1997, Utah State Historical Society and Weber County Commission, p. 184. NOTE: The Malans and Cardons joined the Mormon Church in Italy and immigrated before the railroad crossed the continent. It appears that they were helpful to the non-Mormon Italians that arrived later on the railroad. Interview Joan Maero Wright Oct. 11, 2006. William Terry, Weber County History Is Worth Knowing, p. 45; records of the Bertinoti Ditch in possession of Anna Keogh, Ogden Utah. Land abstract for Bingham Farm. Probate records of Michael Bertinoti.